The Ottawa Senators reserve goaltender Robin Lehner sure picked a good time for his first career shutout: two days after the Senators traded for St. Louis’s highly touted netminder Ben Bishop. A little competition never hurt anyone! 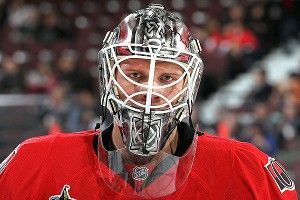 The trade took place after Senators starting goalie Craig Anderson sliced his finger badly enough to preclude him from playing; Lehner was also called up from the AHL’s Binghamton that day and made 28 saves in a 5-2 victory over the Islanders. It will be interesting to see what unfolds between Lehner and Bishop. Last season, Lehner helped lead the Binghamton Senators to the AHL’s Calder Cup and was named MVP of the playoffs; this year, Bishop has been the AHL’s top regular-season netminder for the Peoria Rivermen and was even named the MVP of the All-Star Game. Maybe that explains the next-level appearance. After all, what better way to motivate someone like that than to trade for someone like Bishop? And so the Senators, who stand at sixth place in the Eastern Conference and are just three points back of Boston for the top spot in the Northeast Division, suddenly find themselves with the good kind of goalie situation on their hands. Don’t look now, but the Buffalo Sabres are just four points out of playoff contention. I know, I couldn’t believe it myself! The Sabres are 5-0-1 in their last six games, the most recent two of which were back-to-back shutouts by goalie Ryan Miller. “That’s the Ryan Miller that won the Vezina Trophy,” defenseman Mike Weber said on Thursday night, after the Sabres defeated the Sharks 1-0 in San Jose. (Miller made 43 saves Wednesday as Buffalo won 2-0 in Anaheim, all but torpedoing the Ducks’ chances of sneaking into the postseason.) Still, not all is celebratory in the Sabres locker room: Earlier this week, Miller openly expressed his displeasure that the team traded Paul Gaustad. “I’m not going to lie. I’m not real happy about the way it all turned out. But that’s the business of hockey,” he said. “Like I’ve said, we don’t make those decisions. That’s more proof because if I had any more influence Paul would still be here.” If the first-round draft pick that the team got for Gaustad had feelings, they’d be incredibly hurt. With Roberto Luongo making 29 saves for his 58th career shutout Thursday night, the Vancouver Canucks became the first NHL team to 90 points in the standings, outlasting the St. Louis Blues, 2-0. Between Luongo and Miller, it’s been a good few weeks for Goalies Whose Fans Wanted Them to Be Traded in November. Apropos of very little, I enjoyed these saves by Tampa Bay’s Mathieu Garon.